This vegetarian pasta is both healthful and comforting on a cool fall or winter evening. Bitter chicories contrast beautifully against buttery pasta and salty Pecorino cheese, with just a hint of heat from crushed red pepper flakes. 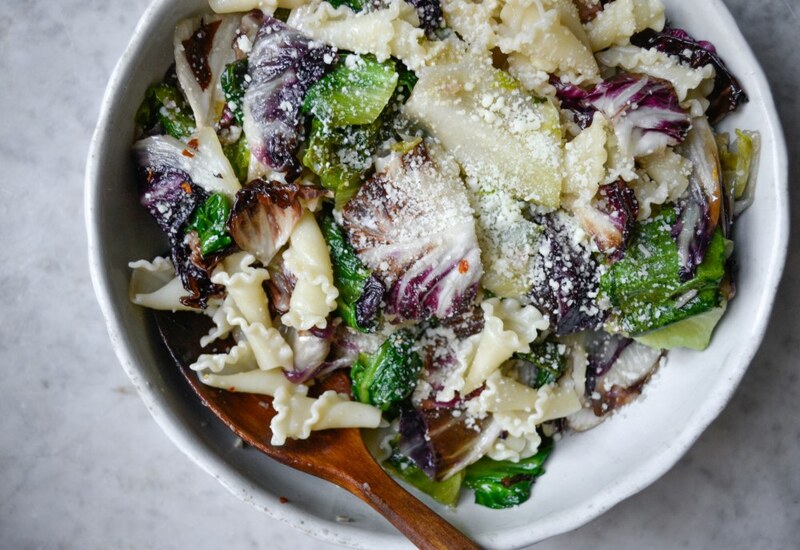 Radicchio and escarole are filled with vitamins and minerals, and their strong flavors mellow when cooked for a dish that's quick, easy and filled with greens. Ready in just 20 minutes, this pasta makes a great dinner when you hardly have anything in the fridge. If you don't have Pecorino on hand, use grated Parmigiano Reggiano instead. Buon appetito! For a more luxurious dish, start by cooking 1/2 cup chopped pancetta until golden and crispy. Remove with a slotted spoon and continue with the recipe, as written, cooking the chicories in the fat rendered from the pancetta. Add the pancetta along with the red chili flakes at the end of the cooking process. Per Serving: 375 calories; 21g fat; 37.8g carbohydrates; 9g protein; 7mg cholesterol; 105mg sodium. Really good pasta for date night! I made this for my husband and added a side of chicken to his dish. He's now a lover of chicory. So glad to have found this recipe and happy to add it to our kitchen repertoire. Chicories are super underrated! They have great taste, especially when paired with the Pecorino cheese. So yummy! If you're looking for a crowd wowing, impressive salad, this is it.